Sometimes you find yourself lost in a daydream pondering the ideal world. More often than not, that ideal world is full of bacon. Sometimes, depending on the day or your workload, it involves a drink or two. Occasionally, you have the wherewithal to act upon this daydream and you do it. Cue: my life. I’m not going to lie, these pudding shots required about 75% of my heart and soul, a lot of bacon, and tons of patience, but they were worth it. 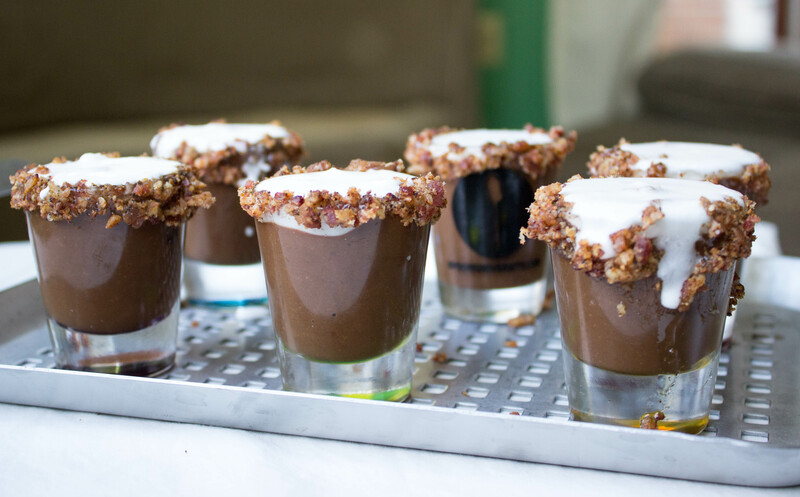 From the rich, chocolate flavor of the homemade espresso pudding spiked with enough vodka to taste it but not really taste it to the salty bacon rim and creamy coconut cream, these shots will get your night started in a deliciously classy way. One of my roommates described the flavor as “something you would get from a restaurant” and I imagined for a moment I was the female version of Daniel Boulud, and everything was right in the world. In a small cup, combine 3 tablespoons corn starch and 2 tablespoons water. Stir to fully incorporate and set aside. In a small saucepan, add coconut sugar, cocoa powder, espresso powder, and salt. Turn heat on medium-low and add coconut milk creamer 1/4 cup at a time, stirring to fully incorporate in between each installment. Once all coconut milk has been added, cook for about one minute, making sure the mixture does not boil. Add chocolate chips, stirring occasionally so they don’t stick to the bottom. Add corn starch mixture and vanilla. Stir constantly for about 3 minutes as the pudding thickens. Remove mixture to a heatproof bowl and let cool. This might take a little while, but make sure to stir the pudding occasionally or a skin will form, locking in all the heat and never letting your precious pudding cool. While the pudding cools, it’s BACON TIME. Slice bacon in half length-wise, so the strip is half as wide. Then dice from there. This is the ideal dice for this dish. In a medium frying pan over medium-low heat, add diced bacon and sauté for about 5-6 minutes, or until fully cooked. 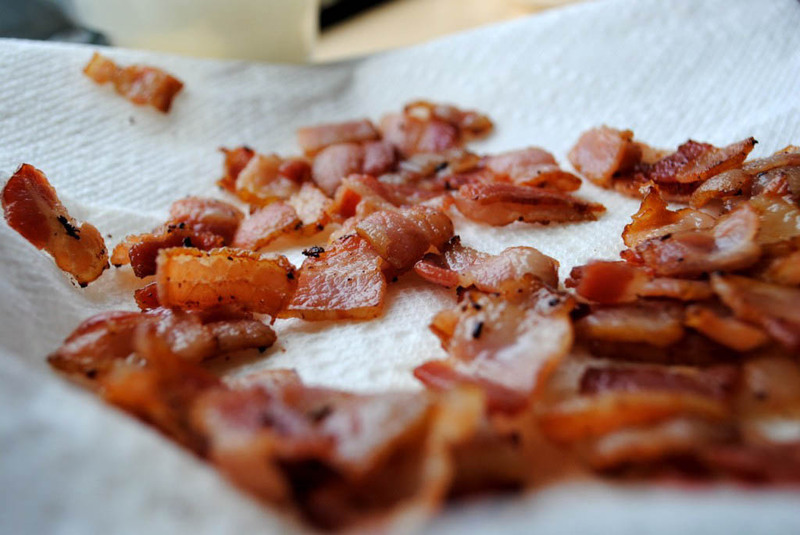 Remove bacon to a plate lined with paper towels to absorb the grease. Pat as dry as possible. Set aside until you’re ready to compile the shots. Once pudding is cool (totally ok to shove it in the fridge/freezer for a bit if you’re impatient), transfer it to the bowl of your standing mixer (or bowl you can use your beaters in). Start the mixture on low, and add a few tablespoons of vodka. Once now-alcoholic pudding is complete, transfer to a flat Pyrex or glass dish and let cool in the fridge for maybe 30-45 minutes. Clean the bowl of your standing mixer because it’s coconut whipped cream time! Add the solidified coconut milk from the top of the can to bowl of your standing mixer. I add a few tablespoons of the still-liquid milk as well. This is okay to do. Oh, add your Stevia or sugar now, too. Turn your mixer as high as it goes, head into the other room and watch Netflix for about 10 minutes. Return back to your beloved mixer to (hopefully) find some whipped cream. If the peaks aren’t super stiff, that’s ok. The cream is more for taste than anything. Transfer your patted down bacon to a cutting board and just go to town chopping it. Even smaller than bacon bites. I’ve tried to do this in my food processor before but the bacon is typically too meaty or greasy that it never works. Do it the old fashioned way. Chop the daylights out of it with the sharpest knife you own. Get out any aggression you have while you’re at it. Transfer your mega-chopped bacon to a small plate. Gather every shot glass you own. If you’re using disposables, make sure to get the plastic ones so you can add the bacon rim. In a tiny bowl, add the some honey. Gently dip the shot glass (face down) into the honey, making sure it covers every part of the rim. 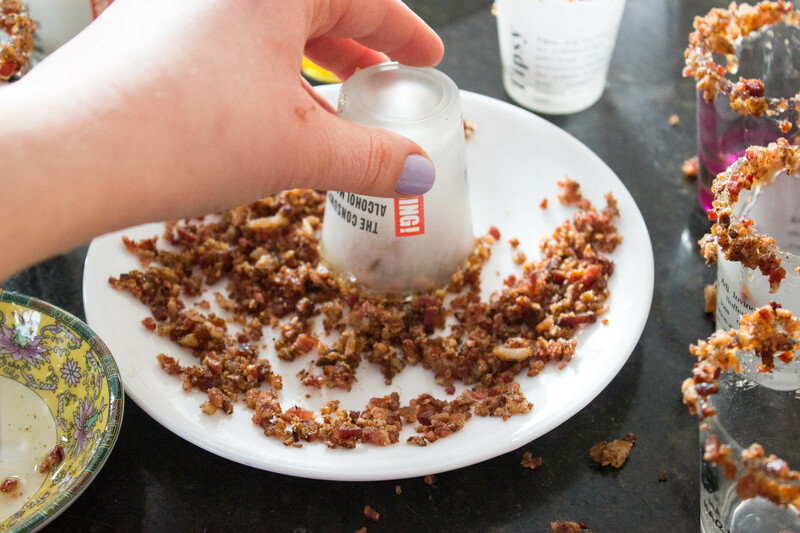 Dip the shot glass into the plate of mega-chopped bacon and twirl so entire rim is covered. Spoon pudding into shot glass. Top with coconut cream. Put assembled pudding shots in the fridge until you’re ready for them. I refrigerated mine for a few hours and the pudding became nice and thick. You might need a spoon!